Our 46th show was once again held in our "home town", Durbanville and was a successful event as always. For the second time we had a triple-show event. Three shows held on one day, independently from each other and not as joint shows, but still affording the exhibitors, visitors and student judges the opportunity to attend three shows for the effort of one. 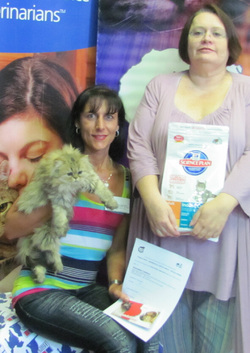 Hills & Cats best gave generous prizes as sponsorship. The Hills table was supported in a big way by exhibitors and visitors alike. We had a large number of visitors, most likely due to the good promotion in the local newspaper Tygerburger. The article about the "movie star" cats, leaving for the USA soon caused quite a lot of interest. The Tygerburger followed up with quite a few photographs and articles in the various editions after the show. The show date had to be changed due to a double booking by City of Cape Town, where yet another department has now taken over the booking of the halls. We were unable to set up the day before, despite a confirmation that has been a standing arrangement for decades. Exhibitors and member rallied and at 06:00 we had a large number of helpers who responded to our plea for help. The hall was set up in record time and the show was a great success! Thank you to all who made this possible. Slide show of photographs by Elizabeth Wentworth.